Piggy's Little Shop: Snagged a Treasury - A for Apples! I just snagged a Treasury! And in honor of my latest necklace.. 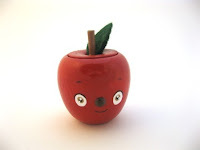 I have decided to do a Treasury full of apples! I love apples since when I was really young.. I guess it's because a. Apple is always the first one that you learn when you are learning about the alphabet, b. My Chinese / Mandarin name is inspired by Apples. 丽苹 literally means beautiful apple :) and c. they are usually more yummy than pears and lot more crunchy than bananas and sweeter than oranges... Hope that's enough reason to love them! Here's my treasury! I think I have done a apple theme treasury before but at that time, I had red apples vs green ones. This time, I decided to pick mainly red apples. From the above selection, the following are my favorites. - I love the cute apple shape box that allows me to keep all knick knacks. It also beautifies the place like a cute ornament. It is available in RED or GREEN. 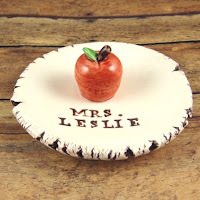 - I love this cute dish that is a perfect gift for any teachers or even colleagues. I can imagine putting my paper clips and other small stationery items on it! You can even custom it by indicating your receiver's name! 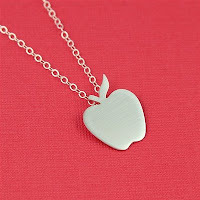 - I love the matte finish on this simple yet chic apple pendant. It's a perfect for everyday wear. Love it! 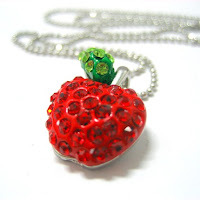 Red Apple Necklace by ME! - I love the bling bling apple that glitters. It stands out with no matter what I wear. Definitely a conversation starter or attention stealer! :P I love it so much that I decided to make one for myself! What a wonderful treasury!! Love the bottom pick - your necklace. Audrey - Thanks! :) I am glad you like it! SleightGirl - Thanks! I prefer Apple Crumbles to Apple Pie :) Especially one with a scoop of vanilla ice-cream! what a cute treasury!! well done! What a cute treasury...love it! Equivoque, Missknits & Sassy - Thanks! Cute treasury. Everything looks so yummy! !